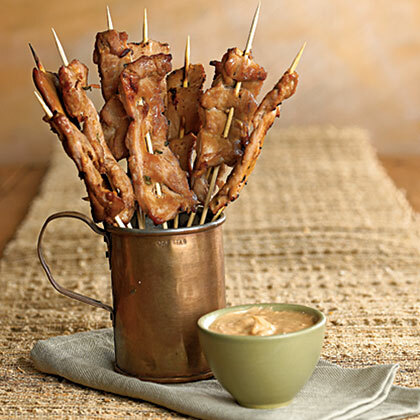 A favorite Thai restaurant serves this wonderful pork satay, so I gave it a whirl at home - delicious! Cut pork tenderloin in half lengthwise. Place plastic wrap over tenderloin halves; pound to 1/4-inch thickness using a meat mallet or small, heavy skillet. Cut each tenderloin half diagonally across the grain into 1-inch strips. Place strips in a large zip-top plastic bag. Combine soy sauce and next 5 ingredients in a small bowl; stir with a whisk until well blended. Pour over tenderloin strips in bag, tossing to coat, and seal bag. Marinate in refrigerator at least 1 hour, turning bag occasionally. While tenderloin marinates, soak skewers in water 30 minutes. Remove tenderloin strips from bag; discard marinade. Thread 1 strip onto each skewer. Place skewers on a broiler rack coated with cooking spray; broil 3 minutes on each side or until done. Serve with Peanut Dipping Sauce.